OrcaBall's mission is to escalate global awareness to the plight of the captive orca and assist with financial aid towards the release of suitable candidates, relocation and the creation of safe guarded ocean environments for their future care. 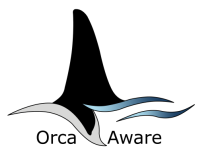 The OrcaBall antenna ball and OrcaBall sticker represent an orca with a collapsed dorsal fin. This is an icon to further public awareness of the issues captive orca face on a daily basis. OrcaBall hopes to see these displayed around the world in a global effort to spread the message. 10% of proceeds made from the OrcaBall antenna ball go to the Orca Research Trust and 10% of proceeds made from the OrcaBall sticker go to the Orca Network. ​Here's a book available from BDMLR! Britain's Sea Mammals retails at £12.95, but as an introductory offer, we're selling it at just £10 plus £2 p&p (first class post). Please call Head Office during working hours to order your copy and pay by credit or debit card. The inspiring stories of Dr Ingrid Visser's encounters with orca can be found in her autobiography Swimming with Orca: My Life with New Zealand's Killer Whales. Called orca by some and killer whales by others, these mysterious animals have become part of Ingrid’s life. She has got to know many orca by sight and calls them her friends. Her experiences with orca challenge their fearsome reputation: she gets into the water with them, watches them hunt, and communicates in any way she can. Ingrid is the only orca researcher working in the South Pacific. This book details her fascinating discoveries, as well as telling her own personal story and describing her amazing adventures. You can also found out more about Ingrid's work at www.orcaresearch.org. Death At SeaWorld centres on the battle with the multimillion-dollar marine park industry over the controversial and even lethal ramifications of keeping killer whales in captivity. Following the story of Naomi Rose, a marine biologist and animal advocate at the Humane Society of the U.S., Kirby tells the gripping story of the two-decade fight against PR-savvy SeaWorld, which came to a head with the tragic death of trainer Dawn Brancheau in 2010. Kirby puts that horrific animal-on-human attack in context. Brancheau's death was the most publicised among several brutal attacks that have occurred at Sea World and other marine mammal theme parks. To find out more about Death At SeaWorld and author David Kirby, visit www.deathatseaworld.com. POD is the photography portfolio of Orca Aware's campaign manager Sam Lipman. Sam's passion for photography has particularly grown since she studied the subject to A Level and she now almost always carries a camera with her. Over the past six years, Sam has been fortunate enough to have some amazing opportunities to photograph an array of wildlife and landscapes and she now hopes that others can gain the enjoyment from her images that she has. Contact Sam via her photography page to find out how you can purchase prints. (10% of every print sold goes towards orca conservation & research). Orca Originals designs are all handcrafted by Julie Walsham. Julie has a background in animal behaviour, training, welfare, rescue and rehabilitation. She is passionate about orca and supports the campaign to end the captivity of these magnificent animals and all other cetaceans. Julie tries to incorporate an educational element into her designs to help raise awareness. Orca Originals donate up to 50% of all profits to a number charitable organisations fighting to end cetacean captivity. You can also visit Orca Orginals on Facebook. Moana Matron Designs is the artistic outlet for Katie Elizabeth O'Neil. After receiving her degree in Marine Vertebrate Zoology with honours from the University of Wales, Bangor, Kate emigrated to New Zealand to follow her passions for whale conservation and art. Since being here, she's attended a number of successful whale strandings and has worked with Dr. Ingrid Visser at the Orca Research Trust. It is Kate's passion for the ocean that drives much of her artwork, and even her artistic name 'moana', meaning 'the sea' in Maori, reflects her deep love for all things marine. You can visit Moana Matron Designs on Etsy for beautiful orca jewellery. BDMLR Orca Aware would particularly like to thank Moana Matron Designs for our wonderful logo and activity sheet orca. Lee Harrison has regularly drawn and written about orca since his interest in them began over two decades ago. In recent years, he has used his artistic skills to educate about the plight of orca worldwide and particularly captive orca. To view Lee's artwork, please visit The Forgotten Orca and Lee's artist webpage, where you can contact Lee to inquire about commissioning artwork. Orcaholic clothing for babies, children, men and women, with smart and casual clothing, as well as fancy dress costumes. Designer JungA Kwon has a BA degree in Clothing & Textiles (Hanyang University, South Korea) and a Certificate of Higher Education in Costume for the Performing Arts (London College of Fashion). After working for a number of Korean fashion design companies and UK theatres, including the Royal Opera House in London, JungA decided to launch her own design company OrcaKwon in 2012.